When David Bowie´s last will was made public, it revealed – among other things – the singer’s wish to be cremated in the traditional Balinese way. The artist requited, if the cremation in Bali were not possible, his ashes to be scattered there nevertheless. Bowie’s appreciation of Bali, and Indonesia as a whole, can be traced back to a trip he took with Iggy Pop, which was recounted in the 1984 song “Tumble and Twirl.” The lyrics don’t indicate that Bowie had the opportunity to observe a Ngaben – the traditional Balinese cremation ceremony he was referring to in his will – but it’s no surprise that he admired this elaborate ritual. 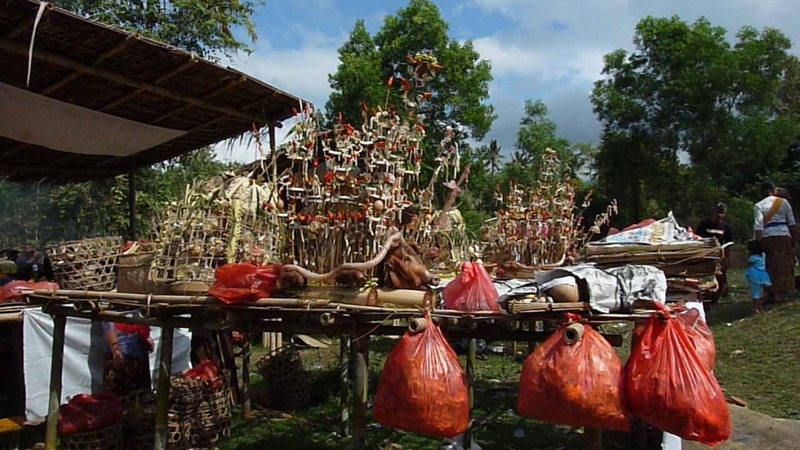 Balinese cremation is a time of celebration. The Ngaben (“turning into ash”) ceremony is remarkable to outsiders and the local people are usually willing to allow respectful foreign guests to experience this unique way of sending off the deceased to the next life. 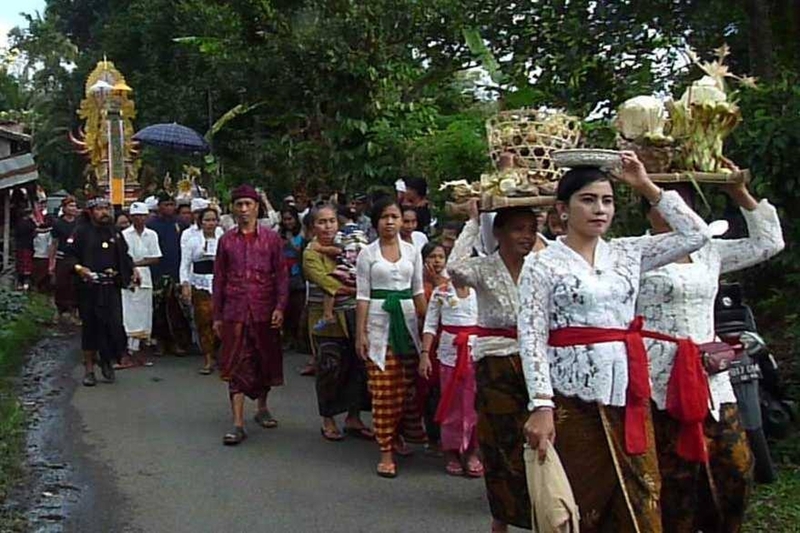 One of the surprising things is that the person who is being cremated may have already been dead for years, but it is only now that the family can afford the cremation ceremony, which is probably the most expensive one in the Balinese rituals. The Balinese view death as being part of a continuous reincarnation cycle which continues until a person’s soul is purified. When this point of complete purification is reached, the individual can be united with the Divine. If a person lived a particularly good life, they reach the state of Moksha where they will finally be freed of the reincarnation cycle. 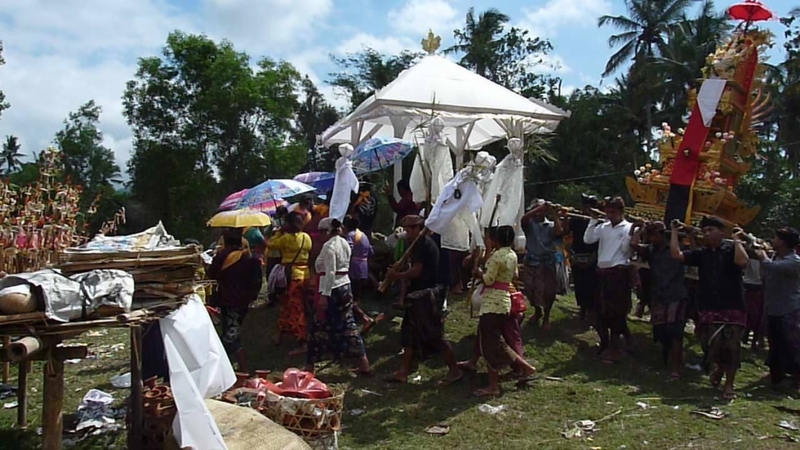 Unlike rich families, which can pay for almost an immediate ceremony (the date of the “good day” is chosen by a priest according to the Balinese Calendar), the poor ones might need to bury the body of the deceased in a simple way and wait for years till they have saved up enough to afford the proper ceremony. It is also very common that there would be a few cremations happening at once and the poorer families might put their money together to place the bodies of their relatives into one big Waddhu (see below). Those families, whose income is quite reasonable but they are still not too well off, would have a small ceremony with the Waddhu and would scatter some of the ashes of the deceased into the sea (ocean or a river that flows to the sea) while saving a part of them for a later, richer, more proper ceremony, where there would be no Waddhu, but a Lembu (see below) still where the ashes would be placed. That was the case of the ceremony I have been invited too for which I felt honestly grateful. The cremation traditionally requires the Waddhu (sometimes also called Bade), a tower construction that has multiple levels – the more levels the construction has, the more important the person was in their life; it is usually made of bamboo, paper, and wood, and the Lembu (a coffin where the deceased’s body is placed and cremated; usually it is in the shape of an ox, but it could also look like other animals, e.g. a lion). The family also needs to pay for: special offerings that will be given on behalf of the deceased, a Gamelan musical procession that accompanies the deceased to the cremation pyre, food and drinks for the guests. The cremation day begins with a procession. During this time the cremation tower will be twirled around – this is to confuse the deceased, so they will not be tempted to return home. For most of the ceremony there will be a real festival atmosphere, and it is only when the body is being burnt that family members will become a bit solemn. The fire is lit by a priest. Afterwards, the ashes are sprinkled with holy water and then delivered into the sea or a river. As I have mentioned above, less rich families would have just a small cremation ceremony and then later would take some of the ashes to continue in the ritual but in a more expensive way. That was the case of the ceremony I went to. The person had been cremated four years ago but only now received the proper ceremony. There was thus no Lembu, but a Waddhu only present. Upon my arrival, I was introduced to the important family members and invited to drink tea and eat some rice cakes with them. Later, I was also invited to share rice (formed into one big heap) and meat and satay (regularly added into the middle of the heap, mixed with chilli and other spices) with several family members, who were eating in a separate place where only several people were invited. I had to wash my hands in a bowl of water and then eat with my hands only, sitting on a mat places on a wooden stage-like pedestal. When we finished eating, the mat was cleaned and a new heap of rice was placed there for another group of people. As we were listening to the traditional band playing, there were also priests and holy men reading the sacred texts, calling upon various gods with their chants. After an hour of eating and talking, women started gathering in a place with the offerings. They places the offering baskets on their heads and off we marched in the procession to the cremation site, were there were other families coming too, so there were several towers places there already and other arrived later. On the site, there were people selling various products in their stalls, mostly food and drinks. There were men sitting together, smoking, drinking, women gathering in other spots, laughing and chatting. In the next four hours of waiting the band kept playing but there was no dancing. Some people would get involved in the procedures required, such as burning some belongings of the dead while chanting the sacred chants, reading and singing out the sacred texts and helping with the offerings and blessings. Two priests arrived to carry out the important ceremonial procedures which were concluded in an elaborate long pray and the blessings with holy water to anyone who wanted to receive them. So, once again, I drank the holy water too. And once again, my body was alright with that! The people then rose up as the priests parted, to continue the procession all the way down to the river, where the Waddhu was partially disassembled, ignited and thrown down from a weir to burn down. And just one more interesting fact: Those individuals who belong to the upper classes in Bali or royalty will usually have a Pelebon (Royal cremation) rather than a Ngaben cremation. This ceremony will be more even more elaborate than standard cremation ceremony, and it will involve a number of different stages. The cremation tower for the Pelebon needs to have nine floors, and it can require as many as 100 people to make it.